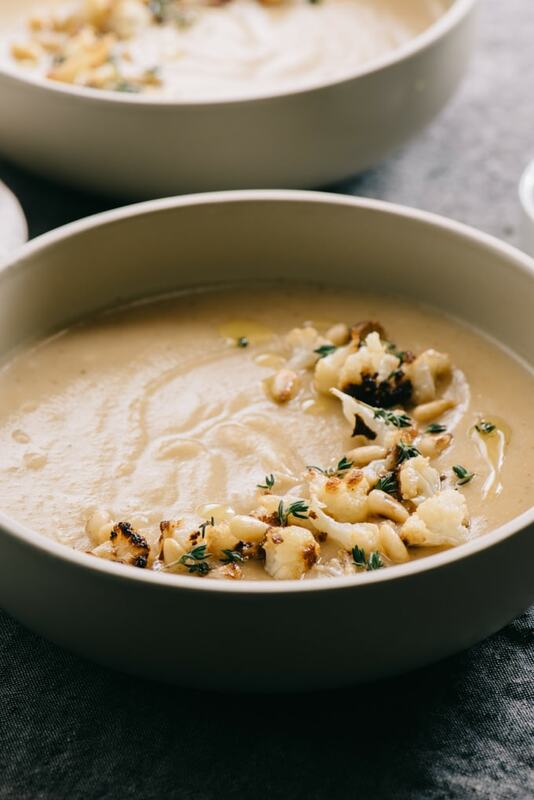 This roasted cauliflower soup is nutty and slightly sweet, with hints of bright flavor from the thyme and olive oil. Naturally paleo and gluten-free, it’s also friendly for vegetarian, vegan, and Whole30 diets. It’s creamy without creamy, dense, nutty, and satisfying enough for a meal. There are so many delicious reasons to make this creamy cauliflower soup! Today marks the start of a three or so day stretch of solid rain along the east coast. Couple that with the head cold I’ve been fighting for over a week and all I want to do is crawl into bed and get cozy with my Netflix queue. If April showers bring May flowers, surely May showers bring grumbles and malcontent. Alas, there are tiny humans that need mothering and laundry that needs folding, so I suppose I’ll get dressed in real clothes and join the functioning world. Meanwhile, I’ll cope with the general dreariness by tucking into a steaming bowl of creamy roasted cauliflower soup. The cauliflower crop has been on point this season. There are gorgeous heads of cruciferous deliciousness everywhere I turn and it does not disappoint roasted and blended into a creamy-without-cream soup. I added a head of roasted garlic to the cauliflower, because reasons. Delicious, savory, sweet, yummy reasons. I have been obsessively reading my most coveted Christmas gift, J. Kenji López-Alt’s The Food Lab. He devotes a section to making creamy vegetable soups sans cream, and this soup is based on his methodology. And it’s perfection. >>> Pin it now! 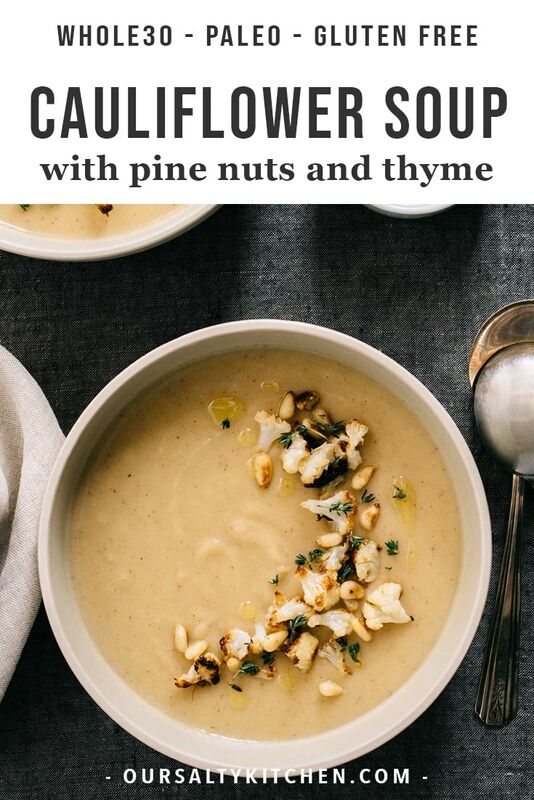 Click here to add this paleo and vegan friendly cauliflower soup to your recipes board on Pinterest. This recipe takes some time, but most of it’s hands off. As the name suggests, take the time to roast the cauliflower instead of tossing into the soup raw. You’ll be rewarded with the creamiest, most flavorful cauliflower soup you can imagine. Chop a head of cauliflower into florets, toss with a few glugs of olive oil, then spread the florets onto a baking sheet. Slice the top off a whole clove of garlic, drizzle the raw cloves with a little oil, then wrap the whole head of garlic in aluminum foil. Pop that guy onto the baking sheet with the cauliflower, then roast ’em. They’ll take anywhere from 40 minutes to an hour to reach roasted perfection, but it’s worth the wait. The cauliflower will likely finish before the garlic, so keep an eye on it starting around the 40-minute mark. It’s done when it’s browned and caramelized, and super tender. The roasted garlic is done when it’s golden brown and soft. If the cauliflower finishes first, simply remove the roasted garlic using tongs and place it directly on the oven rack to finish roasting. Reserve a cup of so of roasted cauliflower florets to garnish the soup. While the garlic and cauliflower are roasting, you’ll spend a few minutes chopping up an onion, and another 20 or so minutes sweating that sucker in some butter (or ghee for a paleo or vegan version). Once the cauliflower and garlic are done roasting, add them to the onions along with some peeled and cubed potatoes (that’s where the creaminess comes from! ), broth (bone or vegetable, homemade is best), and fresh thyme. Simmer until the potatoes are tender. Then fish out the thyme sprig, and blend it all up with an immersion blender. 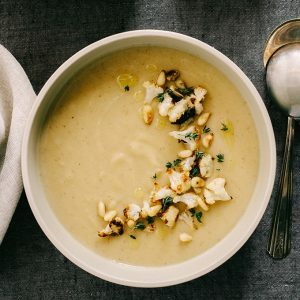 Creamy, dreamy, roasted cauliflower soup! Garnishing soup is the secret to taking it from delicious to wowza. It ain’t just for show. 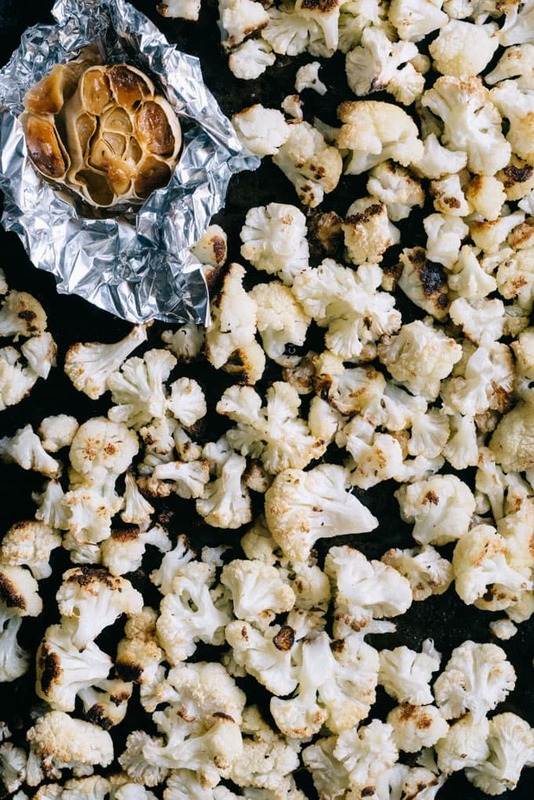 Toasted pine nuts enhance the overall nuttiness of the roasted cauliflower. Extra virgin olive oil brings a subtle fruitiness that plays off the sweet notes of the roasted garlic and cuts through the creamy body of the soup. Garnish is my friend and it should be yours too. 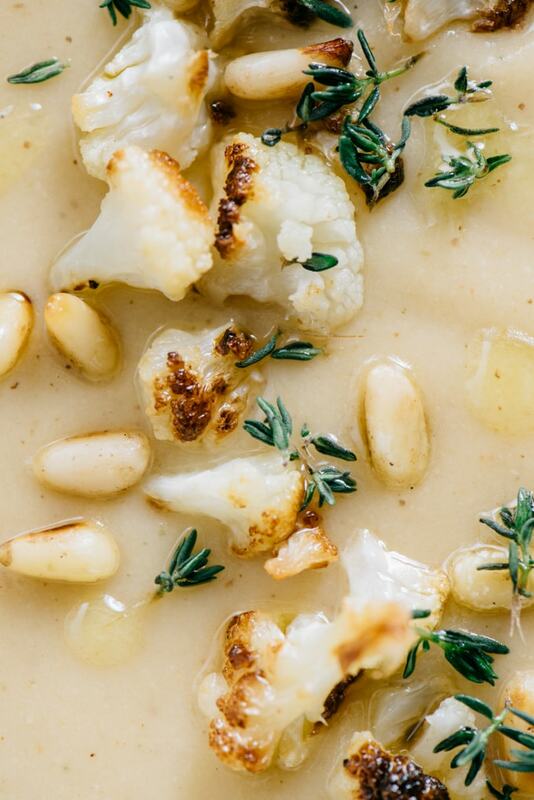 This roasted cauliflower soup is friendly to nearly all of the diets. Make it vegan or vegetarian by using vegetable broth (homemade is best if you have it). I served this on its own for dinner with a simple tossed green salad and it was super filling. It would also make a great starter for Thanksgiving! Leftovers keep in the fridge for about a week, but it freezes exceptionally well. So go ahead and make a double batch and save half for a quick and easy dinner down the road. One of my favorite ways to freeze soup is into individual containers. I can pull one or two out of the freezer in the evening and transfer to the fridge for a delicious, home-made lunch with zero fuss the next day. Soup is always in season, but it’s especially cozy in cool weather. You’ll love these other cool weather soup recipes from OSK! PIN IT NOW, MAKE IT LATER! 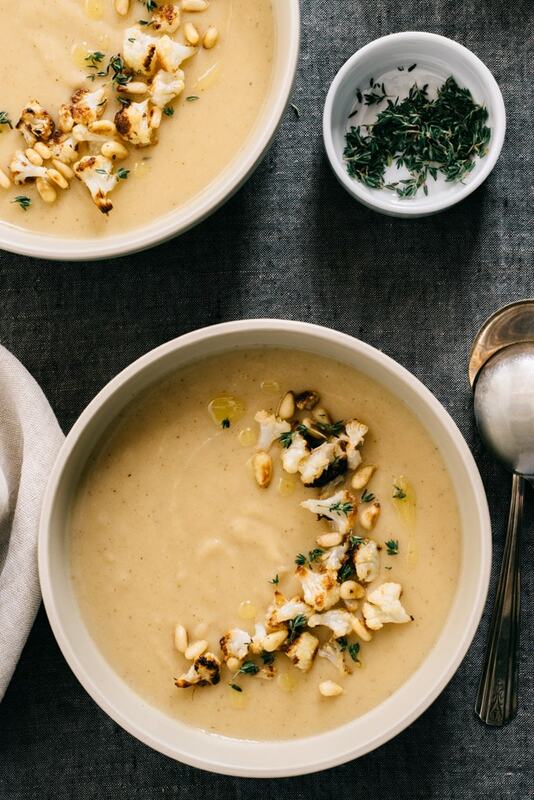 CLICK HERE TO PIN THIS RECIPE FOR CREAMY ROASTED CAULIFLOWER SOUP. This paleo cauliflower soup takes some time, but most of it's hands off. Do also take the time to garnish this soup properly. 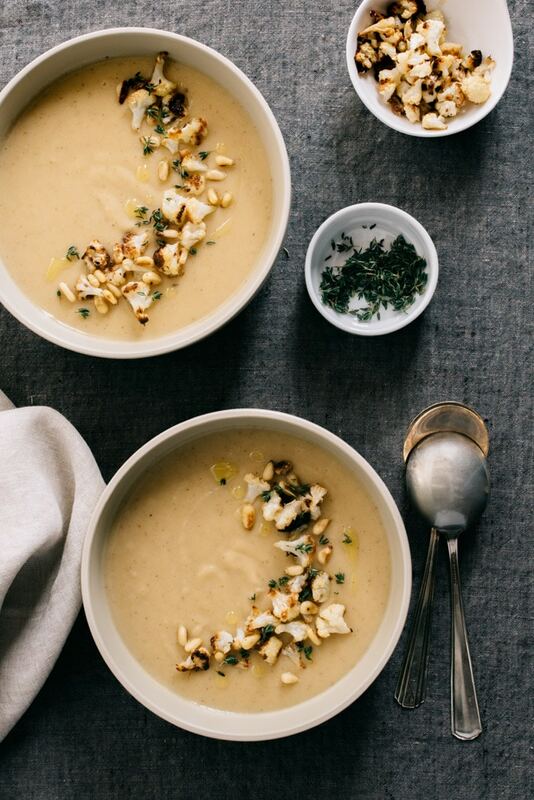 You'll be rewarded with the creamiest, most flavorful roasted cauliflower soup you can imagine. Heat the onion to 400*F.
Toss the cauliflower florets with 1 tbsp olive or avocado oil and spread on the baking sheet. Slice off the top of the head of garlic and rub another 1 tbsp of oil into the exposed garlic cloves. Wrap the garlic in aluminum foil and add it to the baking sheet. Roast the cauliflower and garlic until the cauliflower is golden brown and tender and the garlic is soft and squeezable. This will take anywhere from 40-60 minutes. The cauliflower may finish roasting before the garlic, so check it every 5 minutes after the 40-minute mark. Halfway through the roasting process, start the onions. Heat a large soup pot or dutch oven over medium heat. Add 1 tbsp of butter or ghee and heat until it melts. Add the onions to the pot, stir to coat in the fat, and then cover and sweat, stirring occasionally, until the onions are soft and translucent about 20 minutes. If the onions finish before the cauliflower and garlic, turn the heat down to low and keep covered, stirring occasionally. Add the roasted cauliflower to the pot, reserving about a cup of the tiniest florets for garnish. 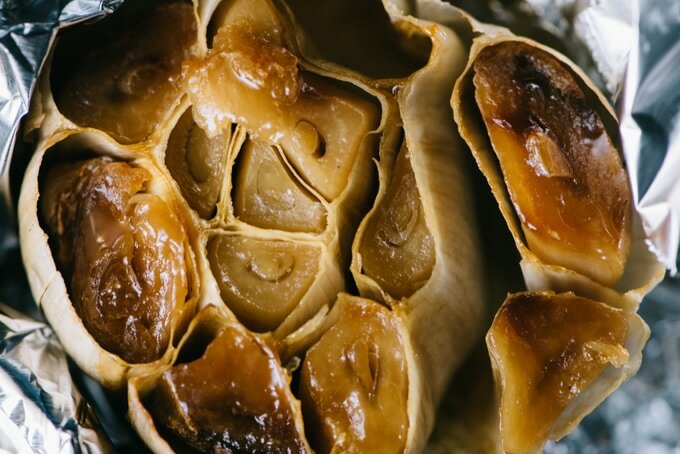 Allow the garlic to cool for a few moments, then squeeze the roasted garlic cloves out of the papery shells and add to the pot. Add the diced potato and enough broth to just barely cover the vegetables (I used about 4 cups). Give everything a quick stir and then toss in a sprig of thyme. Increase the heat to medium-high, bring the liquid to a boil, then reduce heat to medium-low and simmer until the potatoes are soft, about 20 minutes. While the soup is simmering, heat a small skillet over medium high heat. Add the pine nuts to the pan and toast, stirring continuously, until the pine nuts are lightly golden brown. Remove from heat and set aside. Once the potatoes are soft, remove the thyme sprig. Blend the soup with an immersion blender (or in a blender in batches) until smooth and creamy. If the soup is too thick, add a bit of extra stock or water, 2 tbsp at a time. Taste for seasoning and add salt and pepper to taste. 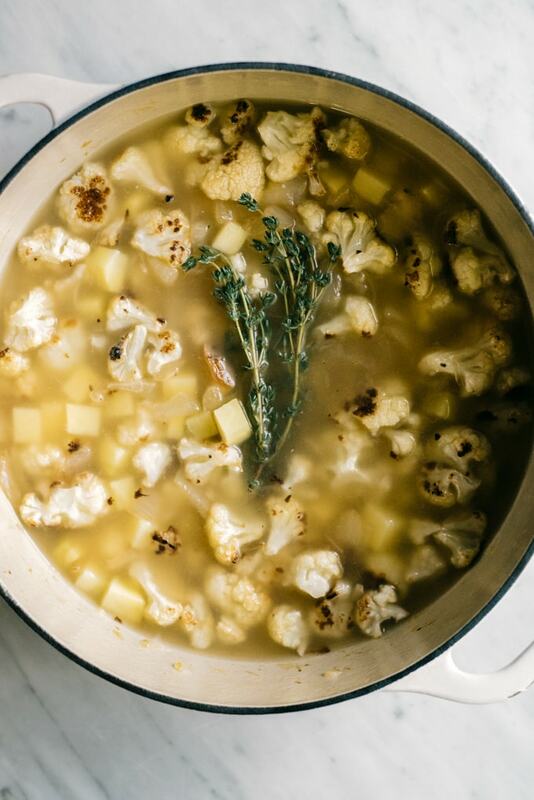 Ladle the soup into bowls and garnish with olive oil, cauliflower florets, pine nuts, and fresh thyme leaves. Serve immediately. This soup keeps in the fridge for up to 5 days, or in the freezer in an airtight container for up to three months. Disclaimer. This post contains an affiliate link, which means we receive a small commission if you make a purchase using this link. Wow.. really delicious and easy to make. It is really quite elegant. I use Kerrygold butter and it makes it yummy. Love the garnish ideas. Thanks for a superb early Fall recipe! So glad you loved it! And I love the suggestion of using Kerrygold – a great one! Any chance I could use rutabaga instead of potatoe? I haven’t made this sub myself, but it should work well! I’d love to know how it turns out if you give it a try.